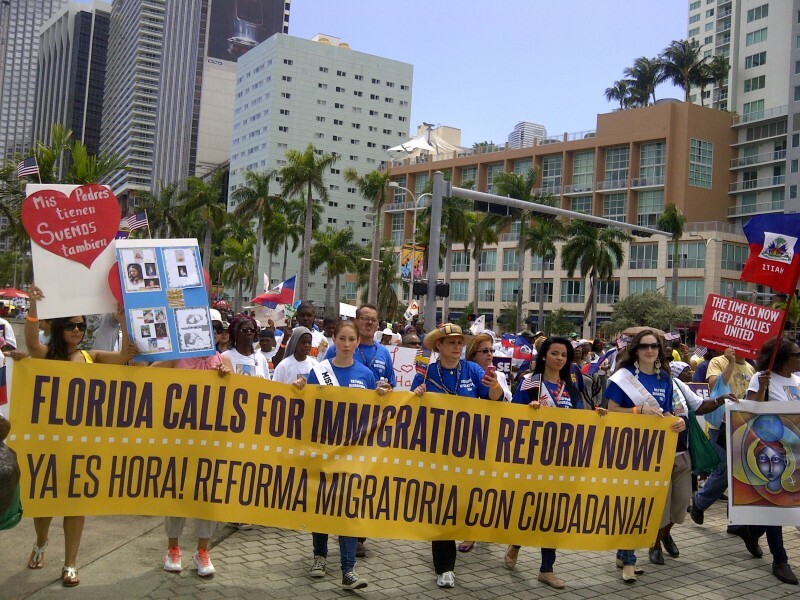 Big Miami rally for immigrant rights | Fight Back! Miami, FL - Over 2000 people marched here, April 6, demanding legalization for undocumented workers and calling for an end to the deportations of immigrants. Young and old, undocumented and documented, workers and students came together in order to push local and national policy makers, including President Obama, into immediate action. 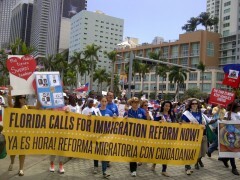 The march began at noon in Jose Marti Park, located at the center of Little Havana in Miami. Leaders took to the stage and fired up the crowd with speeches directed toward President Obama and Florida Senator Marco Rubio (R), demanding that they "Say yes!" to immigrant rights. Local leaders Miami Mayor Tomas Regalado and Catholic Archbishop Thomas Wenski spoke out for immigrant justice. Archbishop Wenski, addressing the crowd in Spanish and Haitian Creole, pointed out that most of those in attendance were members of his parish. He declared that the government must not simply pass a comprehensive immigration reform bill, but a "just one." Several immigrants spoke about their families being separated due to current immigration policies. A tear-filled plea from a young immigrant from Nicaragua gripped the crowd. Marbelis Soza explained how her brother was seized by Immigration and Customs Enforcement agents (ICE) and is currently being detained. He will be the fourth member of her family to be deported. Raina Laham, an organizer with People's Opposition to War, Imperialism, and Racism (POWIR), was at the rally holding a sign that read, "Immigrants in, drones out," as part of an anti-drone campaign in South Florida. "Not only are drones being used to kill innocents abroad," Laham said, "but they also threaten civil liberties and lives at home by turning our borders into war zones." Predator drones are currently being used by the U.S. Customs and Border Protection agency — largely along the southwestern border. After an hour at the park, the activists began a 20-block march through the heart of Downtown Miami holding signs that read: “Keep families together,” “Undocumented and unafraid,” and “We all have a dream.” As the massive group took to the streets, cars honked in approval and locals cheered from their windows and storefronts. An hour later, the marchers arrived at the Torch of Friendship in Downtown Miami, where a stage was set up and Afro-Caribbean band Bachaco played. As the rally drew to a close and the last speeches delivered, the activists in attendance left ready to continue the struggle for immigrant rights. Some groups are travelling to Washington D.C. for a national demonstration for immigrant justice on April 10.